Wow! What a great week I just had. I can’t believe it’s already over. 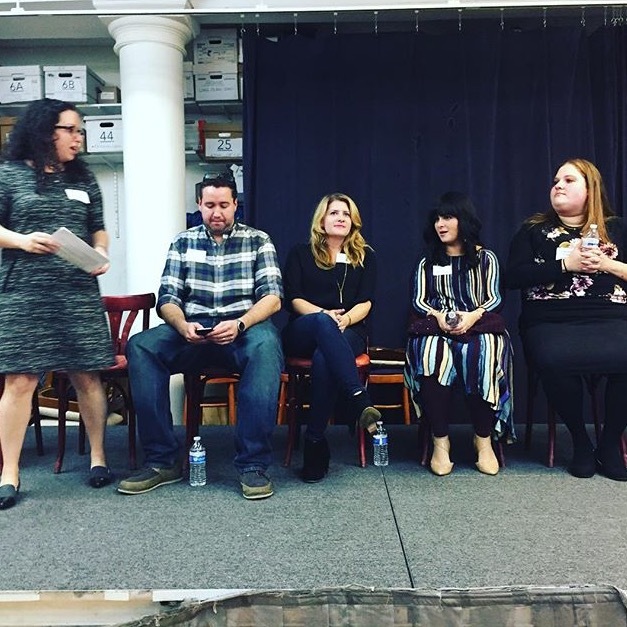 I was lucky enough to be able to attend The Kosher Food Bloggers Conference, Kosher Feast, and KosherFest! I had an amazing time at all three events. I met so many great people and was thrilled to be part of it all. 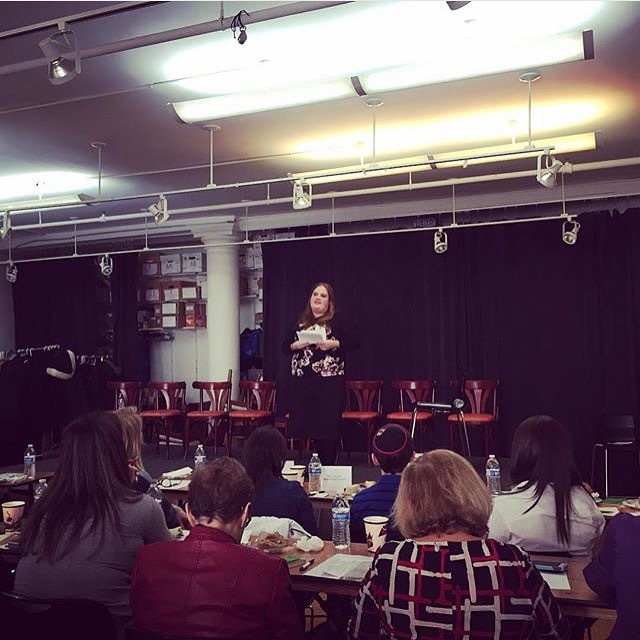 To start off my fun-filled week, I went to the The Kosher Food Bloggers Conference in NYC. I have been following Melinda Strauss, the organizer of the conference, on Instagram for a while now. When I heard about the conference I was very excited. I knew it would be a great learning experience as well as a wonderful opportunity for me to network with other kosher food bloggers. I decided to reach out to Melinda to see if I could attend the event. I was overjoyed when I got an email back from her right away, allowing me to attend the conference. I was super excited and looking forward to the event like crazy. Besides getting to learn a lot, I knew I would be finally able to meet some really cool bloggers I follow. As I mentioned previously, I was excited to meet Melinda. I was also very excited to finally meet Miriam Pascal, aka “The Overtime Cook.” A few weeks ago, I bought her cookbook with a bar mitzvah gift card. By the time of the conference, I had already made many recipes from her cookbook including her Carrot Pound Cake, Chocolate Chip Peanut Pie, and Caramel Apple Bundt Cake. They were all super yummy. I ate a little more than I should have. Who am I kidding? It was a LOT more than I should have! I can’t wait to try her Pretzel-Crusted Peanut Butter Cheesecake this Shabbos. I know it will be delicious. I was also excited to meet Chanie Apfelbaum, busyinbrooklyn.com, and Amy Kritzer, whatjewwannaeat.com. They are both very successful bloggers who always post innovative and creative food. I love checking out their posts. They also were incredibly friendly and nice to me which was awesome. After taping the radio segment with a few other guests, the conference began and Miriam Pascal gave her talk. She talked about finding your influence and building your audience for your blog. I learned a ton from her and took lots of notes. She gave us some really helpful and useful tips that I am already starting to put to use. After Miriam’s session, there was a food styling class with Renee Muller. Being an aspiring food photographer and stylist, – I really found her class very interesting. She gave us some really useful tips and tricks for styling your food. 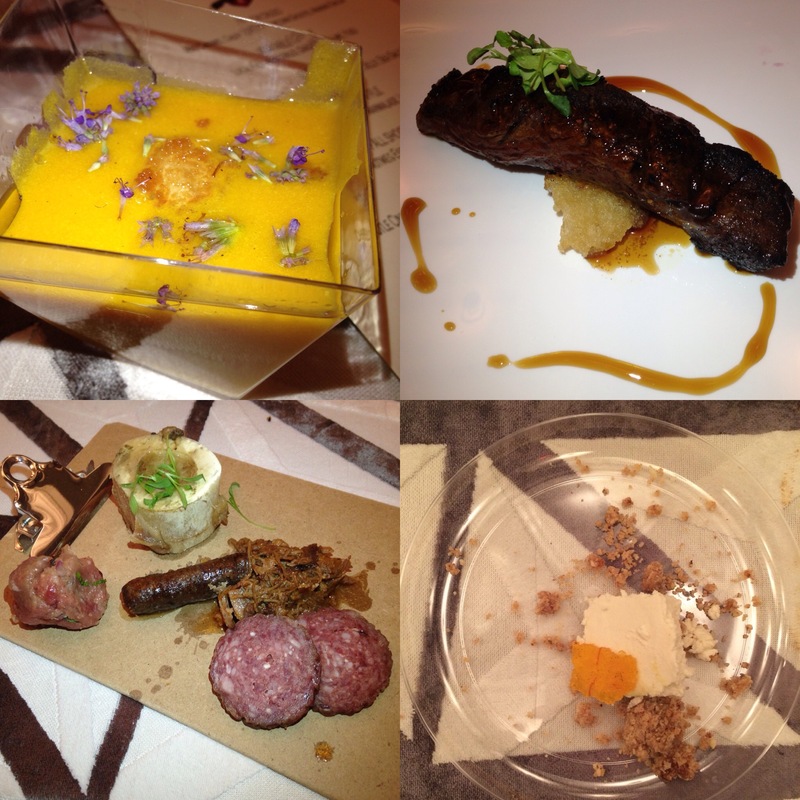 The pictures she showed of food she’d styled looked so yummy! It made me hungry even after I had eaten Gd knows how many croissants that were sponsored for lunch by my favorite place Petite Shell. I look forward to using the things I learned from her class in my own photography. She is immensely talented. Finally was the Q&A section called “How to Make Money as a Food Writer”. The people on the answering panel were Chanie Apfelbaum, Amy Kritzer, Yosef Silver, and Miriam Pascal. My good friend Paula Shoyer was supposed to be on the panel but she unfortunately couldn’t be there because her mom was sick. I hope her mother has a refuah shlemiah and I hope to see Paula again soon. Once the conference was over it was time to head to Kosher Feast. Kitchen Synch was nice enough to sponsor a party van to take us to the dinner. I had so much fun schmoozing with Naomi and many other of the bloggers in the van all the way to the restaurant. 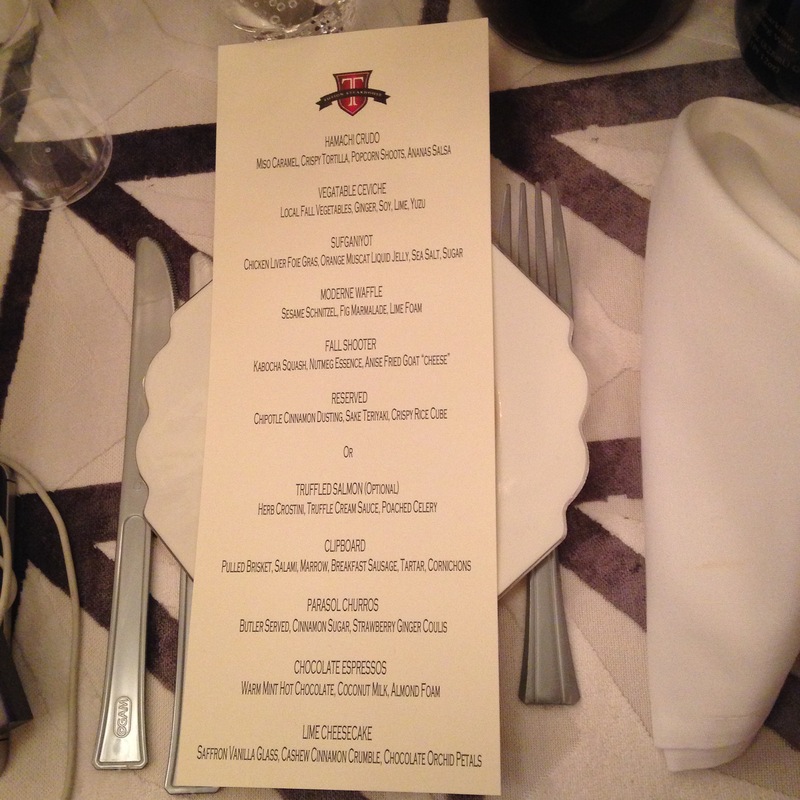 At the dinner, which was at T Fusion Steakhouse, we sat at a table full of foodies. We were all cheering Naomi on when she was giving her speech for being honored. After all the honorees got up and said a few words, it was time for the food. Which in my opinion was the best part! It was the fanciest food I have ever had. 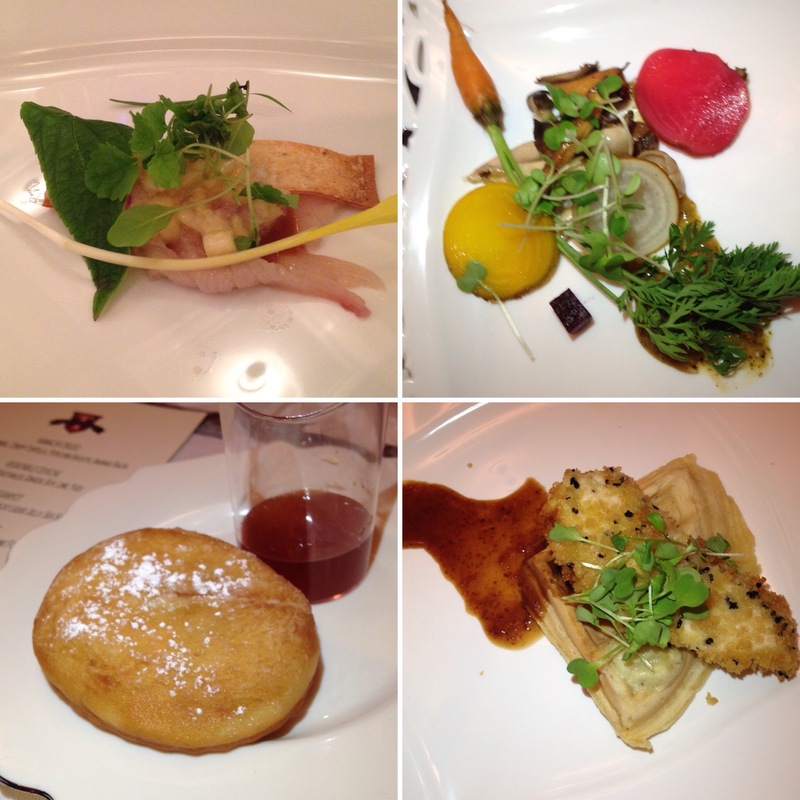 All ten courses were beautifully flavored as well as delicious. The first course was Hamachi Crudo- Miso Caramel, Crispy Tortilla, Popcorn Shoots, and Ananas Salad. Out of all of the course my favorite one was the Moderne Waffle – Sesame Shnitzel, Fig Marmalade, Lime Foam and a Waffle. I also really liked the Churro with the Strawberry Ginger Coulis. By the time the night was over, I was exhausted from the fun day I had. I had met so many great people, ate delicious food, and learned a whole lot about blogging. Not bad for a day off from school. Finally, to end this fun filled, foodie week was KosherFest. I was fortunate to be allowed back to KosherFest this year. I wasn’t allowed to go to the vendor floor but I was allowed in the cooking demo room. 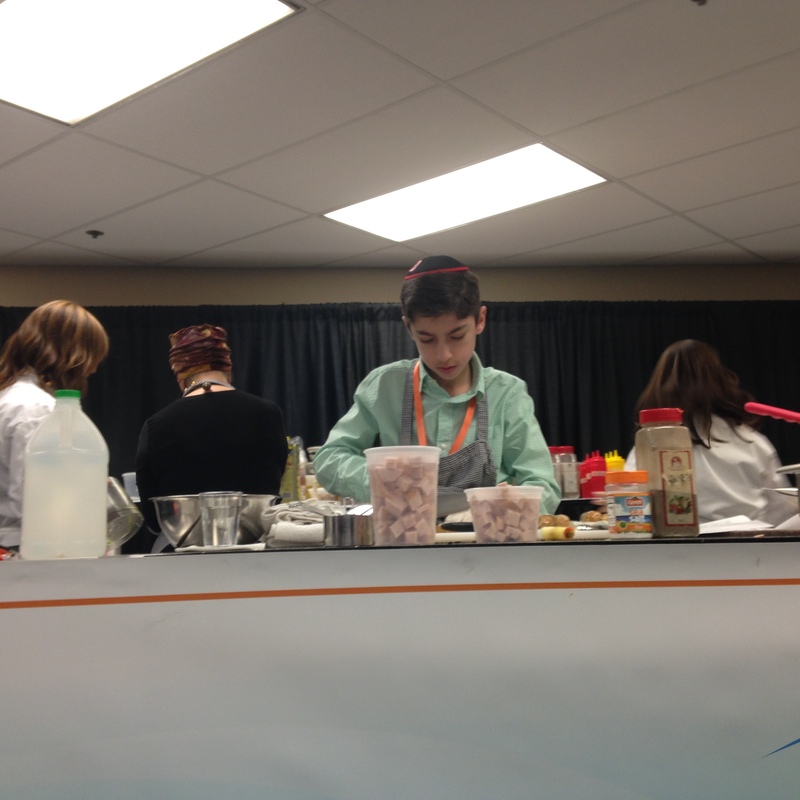 I went to watch Levana Kirschenbaum‘s demo and the CKCA Cooking Competition MCed by Naomi Nachman. Right when I walked in Levana asked me to come up to the stage and help her prepare for the demo. I cheerfully agreed to help her and she quickly threw an apron on over my head. She put me to work prepping the vegetables for the dishes. Little did I know I was about to be her assistant during the whole demo. It was such a pleasant surprise. It was so much fun to be up there cooking with her. After her demo was the cooking competition. I was super excited for this because Jamie Geller was one of the judges and I couldn’t wait to meet her. 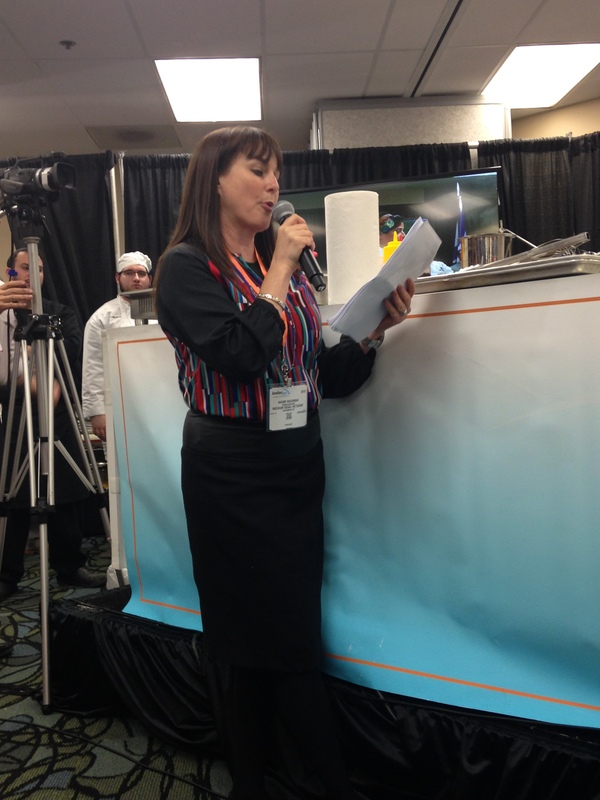 During the 30 minutes for cooking, Naomi handed me the mike, and I talked to the audience for a few moments. In the end Chef Jasmine was the winner. Once it was over Naomi and I dove into the food made by the competitors still in their pots and pans. The food was so yummy! Finally I met Jamie Geller. She came up to me and we chit chatted for a minute. We took a picture together at her request. I was so star struck. I have grown up reading her magazine. To me she is like on the same level as the Food Network Stars. As I said to my fellow foodies when asked on the spot to give a small impromptu speech at KosherFest, it is truly an honor to be accepted, included, and respected by such an incredible group of talented people. When they refer to me as the future of kosher, I am overwhelmed and full of joy. 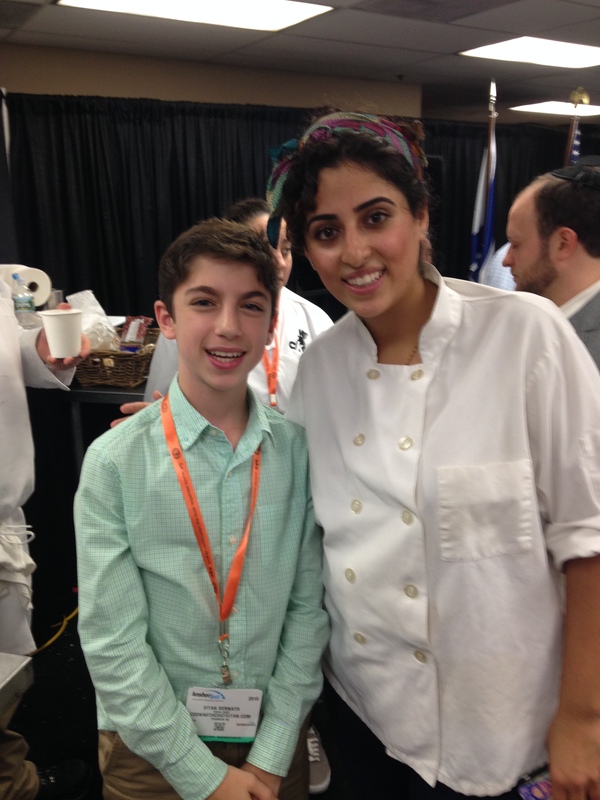 To actually be considered one of their peers and future leaders of the kosher culinary world is simply unreal. So nice meeting you! Can’t wait to see what you do next. It was an absolute pleasure to meet you and your mom! You are a incredible role model for young and old. Thank you for making KosherFEAST so incredibly special this year by joining us. Thank You. It was a pleasure meeting you too. I had a great time at the dinner. I love this article, Eitan!!!!! It was so great hanging out with you at the Conference and you had some great questions for our speakers! I’m so glad you learned a lot and had a great few days with the kosher trifecta! Glad you liked my post! So great meeting you at the conference! I had so much fun!